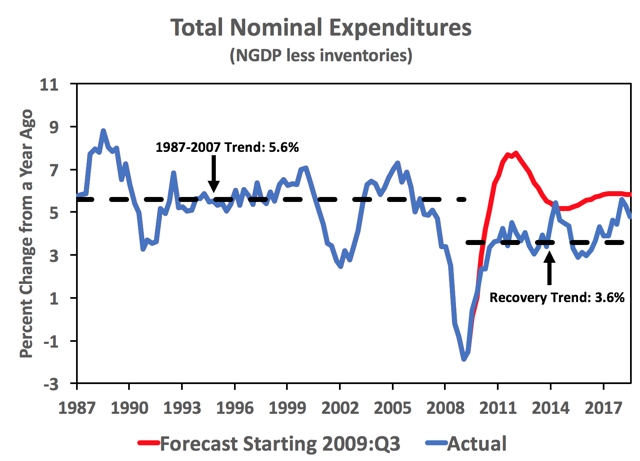 The Fed officially began inflation targeting in 2012, but was implicitly targeting 2 percent long before that time. Below-target inflation has been happening for close to a decade, and for many observers, it is a mystery. Some have wondered if the Fed really understands or even controls the inflation rate. Even Fed officials have been perplexed by the low inflation, since it cannot be explained by their Phillips curve models. 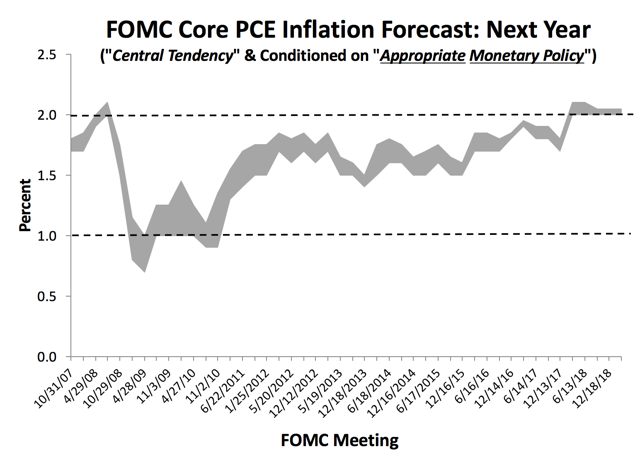 There are reasons to believe that the low inflation is, in fact, the desired outcome of the FOMC. Over the past decade, inflation has persistently undershot the Fed's inflation target. The Fed's preferred measure of inflation, the core PCE deflator, has averaged 1.56 percent over this time compared to a target of 2 percent. The Fed officially began inflation targeting in 2012, but was implicitly targeting 2 percent long before that time. So below-target inflation has been happening for close to a decade, and for many observers, it is a mystery. There have been a spate of articles as to why the Fed has not been able to hit its inflation target. Some have wondered if the Fed really understands or even controls the inflation rate. Even Fed officials have been perplexed by the low inflation, since it cannot be explained by their Phillips curve models. As a result, they sometimes attribute the persistently low inflation to developments such as falling oil prices, demographics, global competition, changes in labor's share of income, safe asset shortage, and even the rise of Amazon (AMZN). These explanations, however, are not satisfactory, since the Fed should be able to determine the inflation rate over the medium to long run. That is, it should be able to respond, over time, to developments that might cause inflation to drift off target. The Fed should be, in theory, the final arbiter of the trend inflation rate. So, why has inflation been so low? In my view, the answer is simple: the Fed is getting the inflation it wants. There is no mystery. One does not get a decade of trend inflation that is below target by accident. Instead, revealed preferences tell us inflation is where it is because the FOMC allowed it to be there. Put differently, the Fed has chosen not to fully offset the shocks and secular forces listed above that have pushed inflation down. This is a policy choice. Fed officials and others may disagree, but the revealed preference argument is hard to ignore. Moreover, there are other reasons to believe that the low inflation is, in fact, the desired outcome of the FOMC. They are presented below. Each participant's projections are based on his or her assessment of appropriate monetary policy. The SEP, in other words, reveals FOMC members' forecasts of economic variables conditional on the Fed doing monetary policy right. And up until recently, doing monetary policy right was not overshooting 2 percent inflation in the following year, as seen in the figure below. Even now, 2 is still seen largely as a ceiling. There is nothing symmetric about 2 percent in these SEP forecasts. Most FOMC members, therefore, have treated 2 percent as a ceiling over the past decade. This is "appropriate" monetary policy for them. Keep in mind that at this forecast horizon, most of them also believe they have meaningful influence on inflation. Both of these observations point to the low inflation as a choice. We directly estimate the Federal Open Market Committee's (FOMC) loss function, including the implicit inflation target, from the tone of the language used in FOMC transcripts, minutes, and members' speeches. Direct estimation is advantageous because it requires no knowledge of the underlying macroeconomic structure nor observation of central bank actions. We find that the FOMC had an implicit inflation target of approximately 1.5 percent on average over our baseline 2000-2013 sample period. Fed officials, in their words, actually want 1.5 inflation on average. And shocker of all shockers, they are very close to getting that just that rate of inflation since 2009. The third reason to believe low inflation is a desired outcome comes from imagining a counterfactual FOMC. 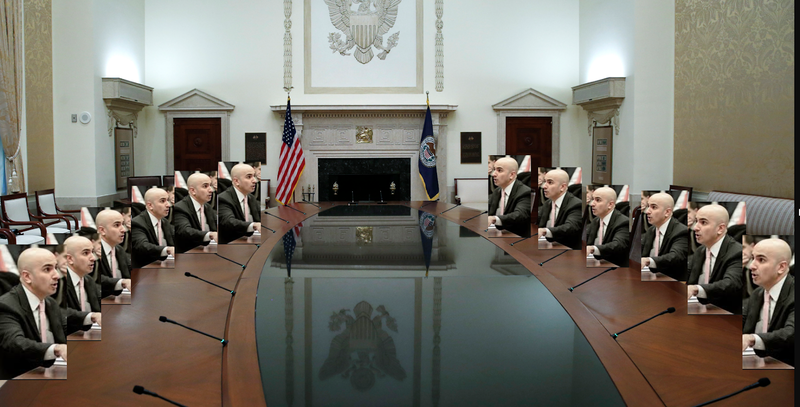 Imagine an FOMC that has twelve members that are all clones of Neel Kashkari, as seen below. In this FOMC, where interest rates were not raised over the past few years - and maybe even lowered - do we really think inflation would be the same? I find that hard to believe.